Evan Turk is an author, illustrator, and animator working in New York City. He is the illustrator of the award-winning book Grandfather Gandhi, Be the Change: A Grandfather Gandhi Story and the author/illustrator of The Storyteller. 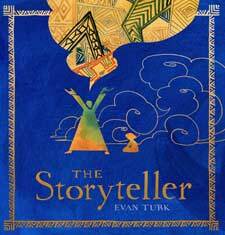 Evan was the recipient of the Ezra Jack Keats New Illustrator Honor as well as the Marion Vannett Ridgway Honor for Debut Illustrator in 2015. Evan is originally from Colorado and loves being in nature, traveling, and learning about other cultures through drawing. He is a graduate of Parsons and continues his studies as a member of Dalvero Academy.